All persons who are participants in a U.S. Marshals Service auction shall be responsible for reading, understanding, and complying with the Terms & Conditions of Sale as specified herein and shall be bound thereby. Special announcements for changes to an auction may be made up to the time of sale and shall take precedence over previous information announced or advertised. This shall NOT apply to the terms contained below in the paragraph entitled “CONDITION, DESCRIPTION, AND REPRESENTATIONS” whose terms may not bemodified orally. Prospective buyers shall not be charged a fee to review a listing of property to be sold by the United States through the U.S. Marshals Service, and/or its agencies, agents, officers, employees, and/or assigns (hereinafter referred to as the “Seller”). Once registered, a participant shall be required to pay only a deposit to participate in an auction and no buyer’s premium, processing fee, admission fee, or any other charge or fee may be assessed to participate in an auction. To qualify to register as a participant, a prospective buyer must complete a bidder registration form and produce a state or federally-issued photo identification card satisfactory to the Seller to obtain a bidder number. No person described below in the paragraph entitled “DEFENDANTS AND OTHER PROHIBITED BUYERS,” and who is thereby disqualified from buying forfeited property in an auction of the Seller, shall be eligible to register as a participant directly or through another. Each bidder is responsible for all bids placed against his/her bidder number. Participants are encouraged to inspect the property prior to the auction. Failure to inspect may not be used by a Buyer as a reason to rescind a purchase. Participants are responsible for conducting their own due diligence to determine value and condition. The auction will be a traditional oral auction providing for fair, full, and open competition. Private sales are strictly prohibited. The purchase of property by a buyer will not be canceled due to any buyer’s failure to inspect, misunderstanding, or error on his/her part. The Seller reserves the right to establish for any auction item to be sold a minimum dollar amount it is willing to accept to sell the property. The Seller is not required to disclose this amount and reserves the right to withdraw property at any time prior to auction or acceptance of a bid. Immediately upon announcement at the auction of the successful bid, the successful bidder may be required to complete and sign an offer to purchase at the successful bid price without condition, in a form acceptable to the Seller. Notice by the Seller of the acceptance or rejection of a bid shall be deemed to have been given at the time written acceptance or rejection is given to the successful bidder or mailed or faxed to the successful bidder or to his/her duly authorized representative at the address or telephone number indicated on the bidder registration form. Acceptance or rejection shall be effective when notice is given or sent, and does not depend on receipt of notice by the bidder. The Seller’s processing of a bid deposit shall not constitute acceptance of a bidder’s offer. The Seller may, at its discretion, waive any minor irregularity in bids received and may reject any and all bids or portions thereof. 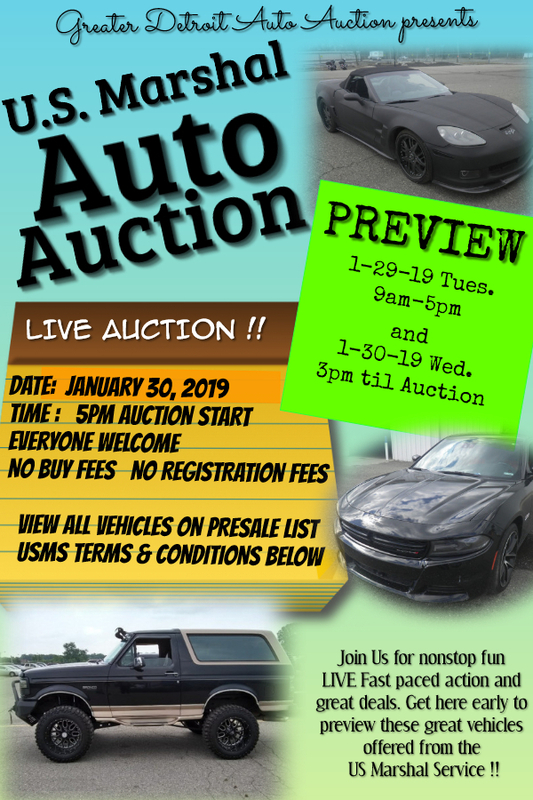 Each successful bidder shall place a deposit of $400.00 in cash, credit card or by money order payable to “Greater Detroit Auto Auction,” as a contractor of the Seller, to become the buyer following the close of an auction. Personal checks will not be accepted. The deposit shall be applied toward the purchase price. A successful bidder who fails to complete a sale shall forfeit the deposit. The Seller reserves the right to audiotape and/or videotape all auctions. The offer to purchase and the written notice by the Seller of acceptance of the offer to purchase shall constitute the contract of sale between the successful bidder and the Seller. Such contract of sale shall constitute the whole contract, unless modified in writing and signed by both parties, to be succeeded only by any formal instrument of transfer. No oral statement or representation made by, for, or on behalf of either party shall be part of such contract of sale. The contract of sale, or any interest therein, shall not be transferred to or assigned by the successful bidder to anyone else without consent of the Seller, and any purported assignment without such consent shall be null and void. All sales to successful bidders are for cash. The successful bidder is responsible for obtaining any financing. The Seller offers no financing and recommends that participants research and obtain financing prior to the sale. Failure to obtain financing does not excuse the successful bidder from completing the sale. A successful bidder shall pay the successful bid amount less the deposit in cash or by money order or cashier’s check payable to “Greater Detroit Auto Auction.” Personal checks will not be accepted. A successful bidder shall have 48 hours from written notice of acceptance by the Seller of the successful bid to make payment in full. Failure to make timely payment in full shall cause the contract of sale to become void and the deposit to be forfeited without further notice or action. A successful bidder who has made timely payment in full shall become the buyer. The buyer must remove the property purchased from the auction premises within 48 hours after payment in full is made. Failure to remove the property within 48 hours shall cause ownership of the property to revert to the Seller and the payment, including the deposit, to be forfeited without further notice or action. The buyer shall pay all taxes imposed on the transaction and shall obtain, at the buyer’s own expense, and affix to all instruments and security documents such revenue and documentary stamps as may be required by Federal and local law. All instruments and security documents shall be placed on record in the manner prescribed by local recording statutes at the successful bidder’s expense. Where applicable, upon acceptance of the offer to purchase, the Seller shall provide the buyer with a “United States Certificate to Obtain Title to a Motor Vehicle” (Standard Form 97). The buyer shall be responsible for obtaining property title through the appropriate Clerk of Court and registering property with the state’s licensing bureau. A Bill of Sale will be issued for motor vehicles that do not require titling. A buyer who fails to tender the required full purchase price or to remove property purchased within the established time frames, forfeits any and all right, title, and interest in the property and the property shall revert to the possession of the Seller and ownership to the United States without further notice to the successful bidder or buyer. Any monies paid will be forfeited and the transaction will be null and void. In the event a high bidder fails to consummate the transaction, the bid deposit and any payment shall be retained by the Seller as liquidated damages. The property offered for sale by the Seller was either seized by and/or forfeited to the United States under Federal forfeiture laws. Any buyer of the property acknowledges that the Seller has acquired the property being sold at auction through seizure and/or forfeiture, and has no specific knowledge concerning the title, nature, value, source, authenticity, fitness, merchantability, and/or any other aspect or characteristics of such property. THEREFORE, the Seller offers the property for sale in "AS IS WHERE IS"
CONDITION AT THE TIME OF SALE, INCLUDING ANY HIDDEN DEFECTS OF ANY NATURE, KNOWN OR UNKNOWN, with no representations, warranties or guarantees whatsoever, express or implied, regarding their nature, value, source, authenticity, fitness, merchantability, and/or any other aspect or characteristics of the property. No statement anywhere, whether express or implied, shall be deemed a warranty or representation by the Seller regarding the property. The buyer of the property agrees that he/she cannot rely on any representation, warranty, or guaranty made by the Seller, or anyone acting as agent of the Seller, orally or in writing, about the property. The buyer of the property agrees to release and hold harmless the U.S. Marshals Service from any and all demands, rights, and causes of action arising from, or to arise from, or by reason of, the U.S. Marshals Service's seizure, forfeiture, ownership, possession, management, use, sale and/or transfer of the property. DEFENDANTS AND OTHER PROHIBITED BUYERS. By statute, the Seller cannot transfer federally forfeited property to any defendant convicted of a violation giving rise to the forfeiture, or to any person acting in concert with, or on behalf of, the defendant. Further, the Seller will not transfer federally forfeited property to any person whose conduct gave rise to a civil forfeiture of the property, or to anyone acting in concert with, or on behalf of, such a person. Employees of the U.S. Department of Justice and their immediate family members,vendors under contract with the U.S. Marshals Service to provide contract services for personal property and their employees and their immediate family members, and claimants in the judicial forfeiture proceeding and their immediate family members,claimants’ employees and their immediate family members, and any agent or nominee of any of the above, are prohibited from purchasing forfeited property, directly or indirectly, offered for sale and, therefore, are barred from placing bids to buy such property. No employee of the U.S. Department of Justice shall be entitled to any share or part of the offer to purchase, or to any benefit that may arise therefrom. Immediate family members are defined as those who live in the same household or are otherwise financially dependent upon the U.S. Department of Justice employee, contractor, or contractor’s employees.